The launch, acceptance and success of the Newman's Own brand turned into a powerful engine for supporting good works. The improbable success of the Newman's Own brand is truly remarkable, since most celebrity-named products fail. Remember Frank Sinatra's spaghetti sauce? Me neither. The irony, of course, is that Newman's stellar acting career has probably been eclipsed by the success of his company's products and his good works. 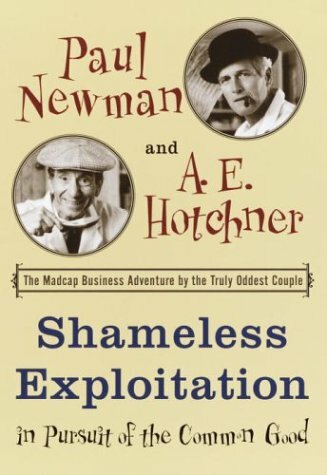 Hotchner (the obvious scribe of the pair) has authored a number of books about Ernest Hemingway, and does a nice job here communicating the challenge of starting a new business, competing against established brands, dealing with personnel issues and other matters common to startups. Though the story is told in both a personal and general way and is entertaining, its value to would-be entrepreneurs is questionable. Sure, the lesson of resolute dedication to core values and dogged perseverance is well told, but ultimately, their success story is the exception rather than the rule. That's truly remarkable and commendable, but probably would be impossible for mere mortals to replicate. The first half of the book concerns the company's launch; the latter portion is about the charities that its earnings support -- mainly camps with activities for terminally ill children. That's really another book unto itself. The story is heartfelt and touching, and reveals that starting a charitable enterprise can often be fraught with many of the same perils inherent in any other startup -- and then some. Overall, Shameless Exploitation is an interesting and informative volume, but as a useful and insightful look into the process of new product development in the very competitive area of food and groceries, it represents a missed opportunity by its authors.